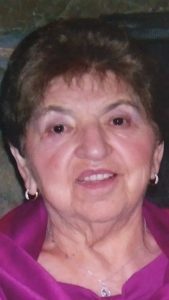 Margaret (Oliveri) DeMarco – of Woburn, January 19th, she was ninety-nine years of age. Beloved wife of the late Salvatore “Sal” DeMarco. Devoted mother of Rosemarie Lichoulas, her husband Richard of Woburn, Robert DeMarco, his wife Deb of W. Newbury, and Linda DeMarco of Revere. Dear sister of Joan Uglietta of Peabody, the late Ann Conti and John Oliveri. A Funeral will be held at the Lynch-Cantillon Funeral Home, 263 Main Street, Woburn, Thursday, January 24th at 9 a.m. followed by a Funeral Mass in St. Charles Church, 280 Main Street, Woburn, at 10. Relatives and friends are respectfully invited to Calling Hours, Wednesday, January 23rd from 4-8 p.m. Interment in Forest Dale Cemetery, 150 Forest St, Malden. Remembrances in Margaret’s honor may be made to the charity of one’s choice. For directions, or to leave an online condolence, please visit www.lynch-cantillon.com or Facebook, under Lynch-Cantillon Funeral Home. Margaret (Oliveri) DeMarco passed away peacefully at home with her dear daughter and husband by her side, Saturday, January 19th, 2019. The beloved wife of the late Salvatore “Sal” DeMarco, she was ninety nine years of age, just two weeks shy of her 100th birthday. The daughter of the late Andrew and Maria (Cucinotta) Oliveri, who were Italian imagrants, Margaret was born in Chelsea where they lived, later moving to Malden. Margaret was a graduate of Chelsea High School, along with the Class of 1937. The Oliveri and DeMarco families made their homes in the Maplewood Section of Malden. This is where the families were all in the same neighborhood, all connected as family and friends. Margaret loved her family and loved being with her family . In 1947, in St. Anthony’s Church Revere, Margaret married the love of her life, Sal Oliveri. They brought three wonderful children into the world of who she was so very proud. Wonderful family vacations were spent New Hampshire and Main, where they would all join in the summer fun, getting cottages, cooking out, and doing all the great adventures of summer. Sadly, when the children were fourteen, Sal passed away unexpectedly, after sixteen years of marriage. Margaret devoted the rest of her life to her children and family. Making sure everyone did what they needed to do, got to where they needed to go and were as successful and happy as they could be! When the children had grown Margaret loved to travel and had taken many trips to Florida with her sister. Margaret had also travelled with her children all over the world; Japan, China, Italy, all over Europe, Scandanavia along with the many different Islands across the world. Throughout the years, Margaret enjoyed the fun, along with the many friendships she made belonging to the VFW bowling league. Monday evenings were always when she and her group of “old time friends” would gather together for “Club” at each others homes. They had a ball! A very laidback, easy going, somewhat quiet woman Margaret’s life was dedicated to God and family. Living every day to the fullest, thankful for all that she had and Margaret gave all that she had, for almost a century. Sadly, Margaret was predeceased by her dear husband Sal, sister Ann Conti and brother John Oliveri and parents Andrew and Maria Oliveri. Margret is lovingly survived by her dear children Rosemarie Lichoulas, her husband Richard of Woburn, Robert DeMarco, his wife Deb of W. Newbury, and Linda DeMarco of Revere. Dear sister of Joan Uglietta of Peabody, the late Ann Conti and John Oliveri. A Funeral will be held at the Lynch-Cantillon Funeral Home, 263 Main Street, Woburn, Thursday, January 24th at 9 a.m. followed by a Funeral Mass in St. Charles Church, 280 Main Street, Woburn, at 10. Relatives and friends are respectfully invited to Calling Hours, Wednesday, January 23rd from 4-8 p.m. Interment in Forest Dale Cemetery, 150 Forest St, Malden. Remembrances in Margaret’s honor may be made to the charity of one’s choice. For directions, or to leave an online condolence, please visit www.lynch-cantillon.com or Facebook, under Lynch-Cantillon Funeral Home. A Funeral will be held at the Lynch-Cantillon Funeral Home, 263 Main Street, Woburn, Thursday, January 24th at 9 a.m. followed by a Funeral Mass in St. Charles Church, 280 Main Street, Woburn, at 10. Relatives and friends are respectfully invited to Calling Hours, Wednesday, January 23rd from 4-8 p.m. Interment in Forest Dale Cemetery, 150 Forest St, Malden. Remembrances in Margaret’s honor may be made to the charity of one’s choice. For directions, or to leave an online condolence, please visit www.lynch-cantillon.com or Facebook, under Lynch-Cantillon Funeral Home. I’m truly sorry for your loss. Your mother was a very nice person.